I grew up eating my Mom and Grandma’s meatloaf, and it was one of my absolute favorite dinners. All these years it’s remained one of my favorite ‘comfort foods’. When I began cooking for my own family, it took me 3 years of watching my Grandma lovingly prepare my favorite dish before I was able to properly ‘eyeball’ the ingredients to replicate that same great taste. Now, every single one of my kids looks forward to that one night a month when meatloaf’s on the menu. However, recently I’ve really been trying to experiment with new twists on some of our old favorites, just to keep things interesting. 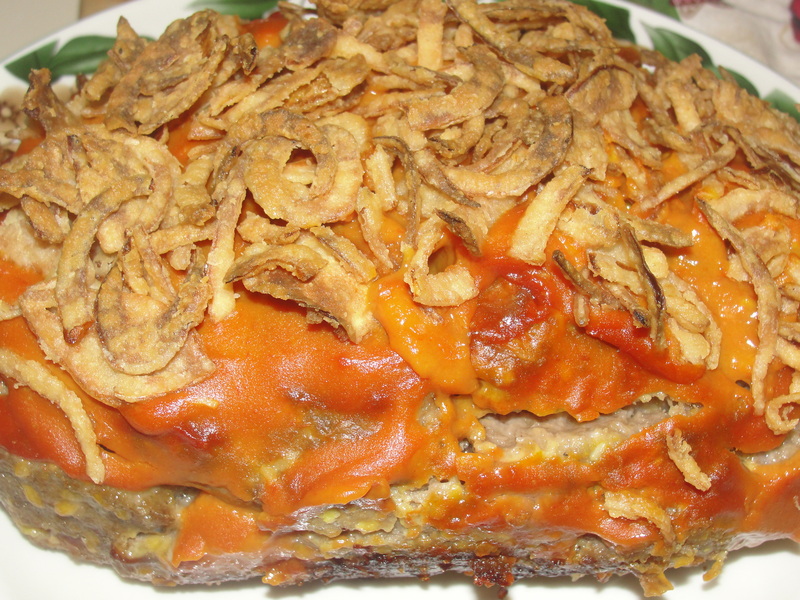 A good friend swore by this cheeseburger-flavored version, so I decided to swap it with my traditional meatloaf in our monthly menu. Warning: This is not your Grandma’s meatloaf! This cheesy little monster of a meatloaf will leave you wanting to lick every last drop off your plate. While I still love, and will continue to make my more traditional version, this recipe is a new family favorite that has already been added to our rotating regular recipes. In a large bowl, combine ground beef and the next 8 ingredients, mixing well. Don’t be afraid to get your hands ‘dirty’ and give everything a good squishing until evenly combined and a uniform consistency is reached. Place both pieces of bread into a meatloaf pan so that they evenly cover the bottom. Form meat mixture into a loaf shape and transfer to the meatloaf pan. You want it sitting directly on top of the bread. In a small bowl, combine mustard and ketchup. Evenly spread the ketchup mixture onto the top of the meatloaf. Bake 40 minutes. 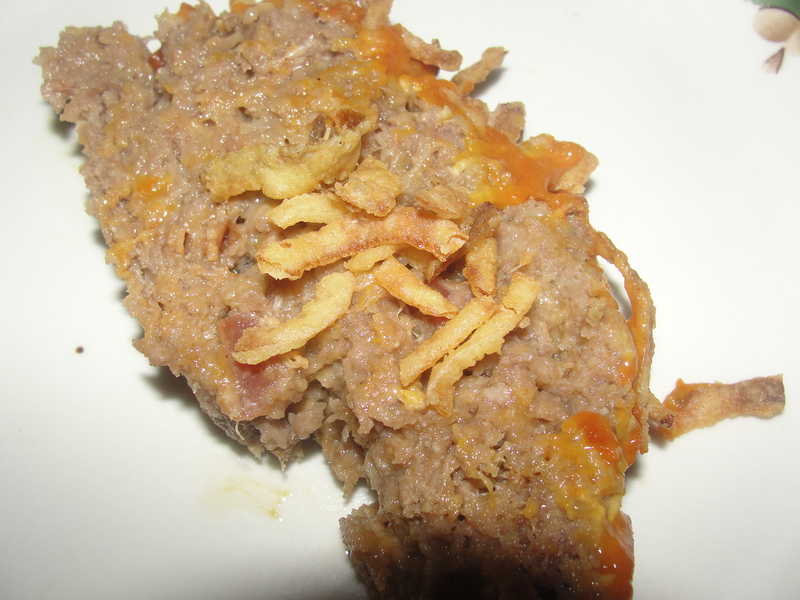 Top with the French fried onions and bake an additional 10 minutes, or until the inside is no longer pink. Remove from oven and let rest for 5-10 minutes. Remove the meatloaf from the pan and discard the grease ‘toast’. Slice the meatloaf and serve. * This is the best meatloaf tip I’ve ever discovered. Instead of your meatloaf sitting and cooking in it’s own grease, or having to use a broiler pan, simply let the slices of bread absorb every last drop of fat that cooks out. It’s that simple. After cooking, simply discard and you’re left with a mess-free loaf that’s ready to be sliced and served.